Calamity in Antarctica. Global Warming alarmists get stuck in ice. A Limerick. – Len Bilén's blog, a blog about faith, politics and the environment. Calamity in Antarctica. 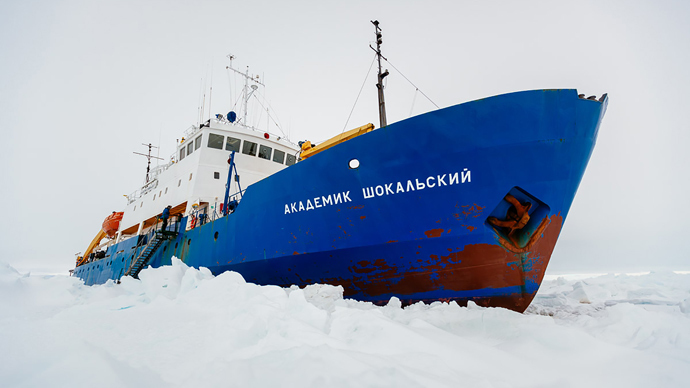 Global Warming alarmists get stuck in ice. A Limerick. set out to recreate the British explorer Douglas Mawson’s travel to Commonwealth Bay in 1912. A film (now a U-tube video) has been found showing Mawson landing in ice free Commonwealth Bay where he landed Jan 8, 1912. That was then, the movie showing an ice free Commonwealth Bay around New Year. Everybody knows the Ice-caps are melting, so BBC and Australian ABC, financed by tax-payers money set out to report the re-enactment of his journey to highlight the impending incredible melting of the ice caps. There were tourists on the ship also, paying their own way wanting to see a glimpse of the rapidly melting ice before it was all gone. Things did not turn out exactly as planned. With the ship moving ahead at full speed the crew ignored all warning signals and plowed ahead through ice that seemed to be thicker than expected. “But this is mid-summer, so the ice must be rotten” they thought and continued full speed ahead anyway. Then the wind picked up, not unexpectedly, since Commonwealth Bay holds the distinction of being the windiest place on earth, even windier than the Aleutian Islands or Mount Washington, and soon the ice closed in on the ship and got it stuck in more than 6 feet of ice. Three ice breaking vessels, a Chinese, a French and an Australian tried to come to the rescue, but their crews had the good judgment of turning back before they got stuck too. A helicopter from the Chinese ice breaker is now near the ship, but cannot evacuate the 52 passengers until the winds calm down. Maybe they should have looked at the statistical data on ice in the Antarctic before risking their lives and the lives of others before taking on such a fools errand. The Ice in the Antarctic is now 1.529 million square kilometer larger than the 30 year average for this time of the year, a 30% increase over the 30 year average, and obviously more than in 1912..
By comparison the North Atlantic ice cap is now only 4 % below average for this time of the year. We hear of the melting ice caps all the time. Why is not the fact that the Antarctic ice cap has set new absolute records since measurements started two years in a row reported? Are journalists afraid of the truth, being scared to be called a skeptic, even a denier, if they mention statistically relevant data? Until people face up to the truth calamities like this are bound to occur. Look at the data before you set sail! 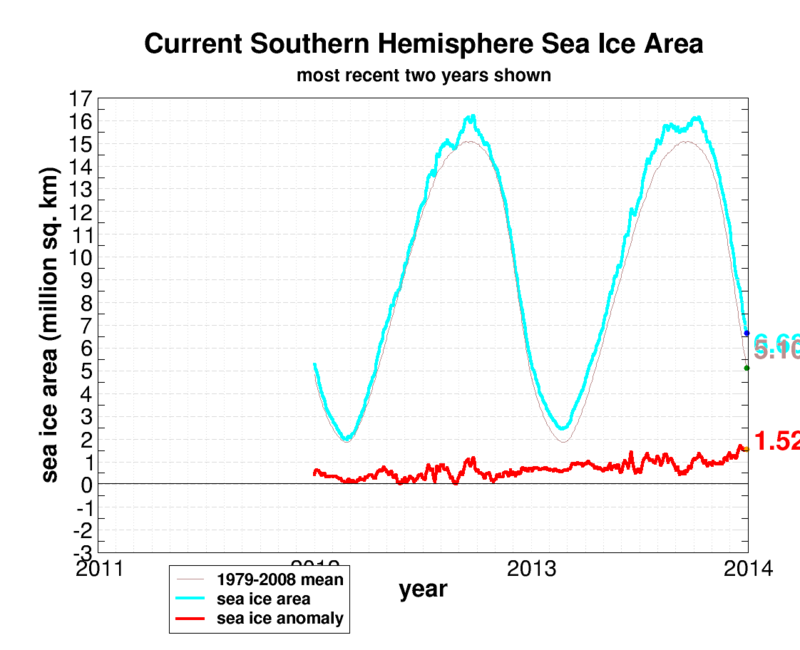 Still not acknowledging the rise in the total amount of sea ice. A sad state for a scientist. He still believes in the failing models rather than observing and drawing conclusions from how nature really behaves. The Chinese icebreaker that supplied the helicopter for the rescue mission is now stuck in the ice too. How inconvenient. Update 3, Jan 7 2014: Antarctic rescue operations complete. Previous Previous post: How do we celebrate Christmas? Next Next post: A sign of God’s hand in the sky. A Limerick.